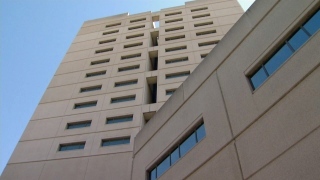 File image of Santa Clara County Jail in San Jose. Nearly 125 inmates at the Santa Clara County Main Jail are refusing to eat in protest of what they describe as unfair treatment. A letter penned by inmates and posted online by Prisoner Hunger Strike Solidarity coalition, a collective that fights for the rights of incarcerated individuals, lists multiple grievances against the San Jose jail staff ranging from unjustifiable and lengthy solitary confinement sentences to inadequate clothing handouts. Among the five overarching claims of wrongdoing, the prisoners say some inmates, mostly gang-affiliated convicts, are being unjustly stowed in isolation for indefinite or drawn-out stays without having committed a serious violation. The protesters are also alleging that inmates are not being provided with enough clean clothing garments. "Our goal is to bring about meaningful, long-standing forms of change by shedding light on and challenging the misuse of authority and abuse of discretion within the administration which translates to violations as well as harsh and unfair conditions for us prisoners," the inmates wrote in the letter. The prisoners also voiced frustration with what they claim is a biased classification process and they also clamored for expanded and overhauled rehabilitation programs. In order to get that message across, voluntary convicts will continue their hunger strike, which began on Monday, for two weeks. Sgt. Richard Glennon, a spokesperson for the Santa Clara County Sheriff's Office, is aware of the accusations, but says that the facility has improved its policies in recent time. "Due to reforms we've already implemented in our custody facilities, we exceed the requirements that most of these inmates are concerned about," he said. "For instance, state policy is a minimum of three hours a week programming for maximum security (inmates). We've doubled that to six hours in our facilities." While he understands the inmates' concerns, Glennon said safety remains a paramount concern. "We cannot discount that the inmates in our maximum security facilities are accused of some of the most violent crimes imaginable," he said. Meals will continue to be presented to every inmate throughout the duration of the strike. If inmates refuse, the cold, boxed meals will be donated to a local Salvation Army shelter, Glennon said. NBC Bay Area is awaiting comment from the Prisoner Hunger Strike Solidarity coalition and Prison Law Officers, two organizations responsible for representing inmates. Santa Clara County Sheriff Laurie Smith and the county's jails have faced scrutiny ever since a mentally ill inmate was allegedly beaten to death in 2015. Since that time, a Blue Ribbon Commission conducted a review of the county's incarceration facilities and advised that Smith be replaced. The commission chairperson did not mince words when addressing Smith and her department. "A defective plane that's crashed, piloted by someone in charge who was indifferent, incompetent or a combination of both," chairperson LaDoris Cordell said.